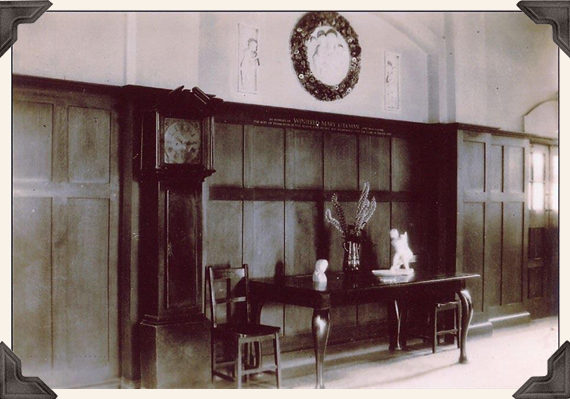 The panelled entrance hall was the first port of call for a visitor to the school. The large grandfather clock was used to determine the time for the sounding of the school bells. Girls who had to see the Headmistress used to 'sit under the clock' to await their fate. Rachel Heyhoe-Flint recalled having often sat there during her time at the school! Mr. Royston recounted that the clock was stolen by thieves dressed as workmen during the 1980s. It was in need of repair and so no one thought to question the team that came to collect it... until it came to light that no one had arranged a repair. The Class of 2011 bought a new clock for the school to replace the original. This thoughtful gift was inspired by Mr. Royston's tale. It now sits proudly in the entrance hall, protected by a secure entrance system! In those days the main corridor had no fire doors sectioning off the entrance hall part. Those were put in during the 'reign' of Mrs. James. They were chosen to fit in well with the decor of the school.